Shirts With Random Triangles: Five Mountain West teams are bowl eligible as Week 12 begins. Here is the rundown of the Mountain West's bowl eligible teams, and those that theoretically are still in the hunt for the wins needed to become bowl eligible. Bowl projections are via Jason Kirk of SB*Nation. Projected bowl opponents marked with "*" indicate team has not yet qualified for a bowl. 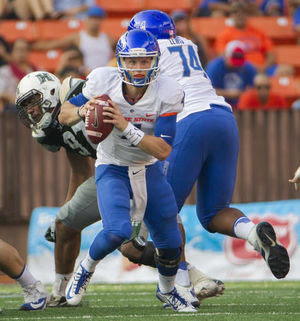 Boise St. projected to punk Western Michigan out of a NY6 bowl. It's certainly possible that Colorado St. gan pick up a win over either New Mexico. It's a little less possible (though not out of the question) the Rams could get by 9-1 San Diego St.